Castle Adventure Redemption Game Machine 2 Players is a luck ticket redemption machine, to drop a coin into the machine to make other coins fall to win tickets machine, with colorful flash LED light striking appearance, can two units play for two players at the same time. In a simple game by inputting coin & pressing "start" buttons to launch tokens, then players according to tokens location to get corresponding lottery tickets or challenge JACKPOT bonus to win more lottery tickets. 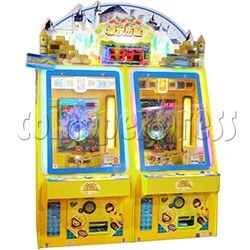 Castle Adventure features with a rotation gate hole to trigger mini ball game, ball falling from nails or drop into holes of mini ferris wheel game or drop down onto the high quality mini coin pusher platform to make coin falling down to win tickets; The design theme with castle & appearance fashion of the atmosphere with gold body can attract players' eyeball to challenge JACKPOT bonus. - if the coin fall out to fall into the hole of gate, then the coin will be dropped down the platform, then will automatically push tokens/coins into the below platform, then will get corresponding lottery tickets, at the same time also the game is over.